This is perhaps the best book I have seen ... in years. I just love it! Esther was very brave. I was little and scared. All the Dear Little Animals. Esther was very brave. I was little and scared. One summer’s day we started a business called Funerals Ltd, to help all the poor dead animals in the world. Esther did the digging, I wrote the poems, and Esther’s little brother, Puttie, cried. One summer’s day three children start a business called Funerals Ltd to help all the poor dead animals in the world. Esther does the digging, her little brother Puttie cries at the grave sites and paints the gravestones, and our narrator writes the poems. This charming, off-beat Swedish story has been translated into English by a New Zealand publisher. The humour is beautifully understate, revealed subtly through Esther’s bossy leadership, the boy’s eagerness to be brave and helpful and in Eriksson’s summery pastel illustrations that depict children resolving a big issue through play. This is a funny book about something sad. A funeral is the special ceremony held when someone dies. People at funerals may feel very, very sad, especially if the person who has died is someone they love. So how can a story about funerals be happy? Sometimes, when you think about something sad, you can feel nervous as well, and try to make a joke. Laughing can help you feel less afraid. Maybe this is what’s happening in this book, All the dear little animals by a wonderful writer, Ulf Nilsson. Like all of us, the boy who is telling the story is afraid of dying. One day, his friend Esther decides to set up a funeral business for dead animals. She digs little graves and holds funerals for dead bees, mice, fish–whatever they can find. The boy writes poems to be read aloud at the graveside, and Esther’s little brother, Puttie, feels miserable and cries. They’re a team! This book is from Sweden, a country in Europe, and so the story was actually written in Swedish. But what you’ll read is in English, because it has been translated, which means changed from one language to another. This is a very difficult thing to do, and I think the translator, Julia Marshall, has done it beautifully. It’s a funny, sad story, and it’s also warm and full of love. You can tell that just be looking at Eva Eriksson’s magical pictures. Don’t be afraid to read it. It’s about the wonder of lives beginning and ending, as all lives do, even the short little lives of tiny ants. Death is a notoriously tricky subject for adults to tackle with children … When the time comes, it’s a blessing to have as many tools to help us as possible. This quirky, unusual little story from two of Sweden’s luminaries of children’s literature could be used as just such an aid – or simply as an entertaining story for the story’s sake. 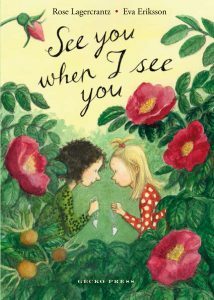 … Sweet, tender, funny and whimsical, this story captures perfectly the child’s perspective and makes for a different yet delightful picture book. This superbly illustrated picture book makes the reader realise that everything must die. The three children in the story come to terms with the ideas of death, funerals and grieving by finding bumblebees and small dead animals to bury. And, quite rightly, Esther the eldest child is the boss of Funerals Unlimited. The illustrations are endearing with the facial expressions and body poses showing us much more than the words could. Just when you worry that the story is becoming emotional and likely to leave you feeling very sad, you are reminded that life must go on. The next day we found something else to do. This book for over fives would be a good addition to the family collection, or for veterinarians to recommend to clients with young children. This charming, off-beat Swedish story has been translated into English by a New Zealand publisher. The humour is beautifully understated, revealed subtly through Esther’s bossy leadership, the boy’s eagerness to be brave and helpful and in Eriksson’s summery pastel illustrations that depict children resolving a big issue through play. Highly recommended for ages 4 to 10. 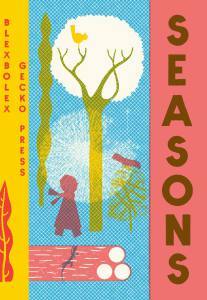 Gecko have … produced a translation of a Swedish story by Ulf Nilsson which deals empathetically with young children’s fascination with death and burial of pets and grieving. Big sister Esther decides all small animals which die deserve a burial. 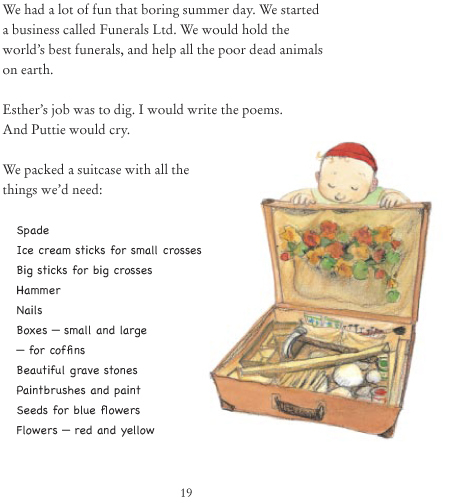 So for a memorable day she, a middle-sized boy (the narrator and poet) and her young brother Puttie set up Funerals Ltd, create a burial kit and find a variety of animals to bury with appropriate poetic ceremonies. Mice, a hamster, a squashed hedgehog, a hare and a rooster are all solemnly named, boxed and buried, Recommended for seven-year-olds and up. With a motto of ‘curiously good books from around the world’ New Zealand’s Gecko Press introduces Kiwis to the best of modern European literature for the young. Gecko’s output continues to be splendid as their latest quartet proves. Before the day is over they have erected tiny crosses over a departed mouse, hamster, rooster and three dead fish that Esther found in the fridge. Each of the children learns something about death as they scour the roadside for flattened hedgehogs. Sweden’s Ulf Nilsson has created a very funny account of children at play which also introduces serious issues of grief and mourning. Eva Eriksson’s colour illustrations are beautiful and the book is neither morbid nor mawkish. Seven-up. Julia Marshall continues to prove she has an eye for what must be a daunting task: choosing ‘the world’s best children’s books’ to translate into English. So far, she’s exhibited a bias toward the Swedish, which is of little consequence other than that the tales tend toward the universal rather than being culturally specific. In this title, death fits this criteria nicely – and having a nice death is exactly what concerns the three central characters, as they scour the countryside for animals in need of a proper burial. Their motivation for ‘Funerals Ltd.’ is mixed: it’s brave and honourable (as Esther observes, ‘The world is full of dead things… Someone has to look after them. Someone unselfish must make sure all these dead things get buried.’); it’s something to do; and it’s an excuse for getting up close to dead things. These many subtexts means the story doesn’t even come close to sentimentality. 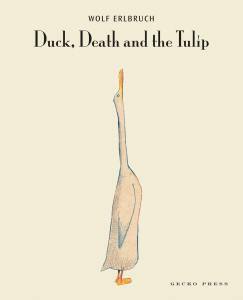 Nilsson is respectful of the children’s antics and emotions, and even of the narrator’s graveside poems, but he still pokes fun at their whimsy and self-dramatisation. 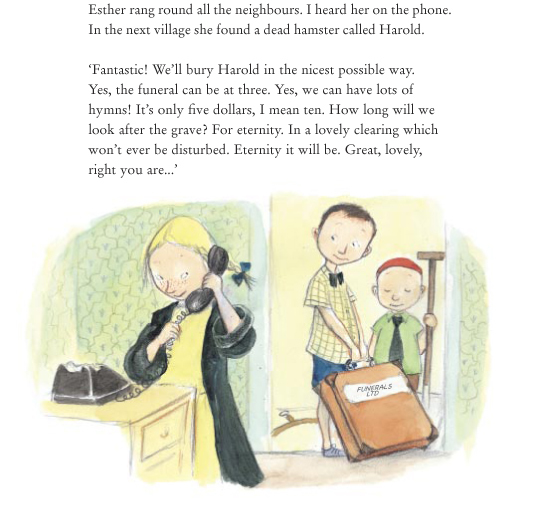 Eriksson’s cosy, innocent illustrations are perfect, At first glance, the children’s high foreheads and wide faces seem a little goofy, until you realise this emphasises the children’s prim industry and their vulnerability. 5 years +. All children have to come to terms with death – even if it’s only the death of a pet. 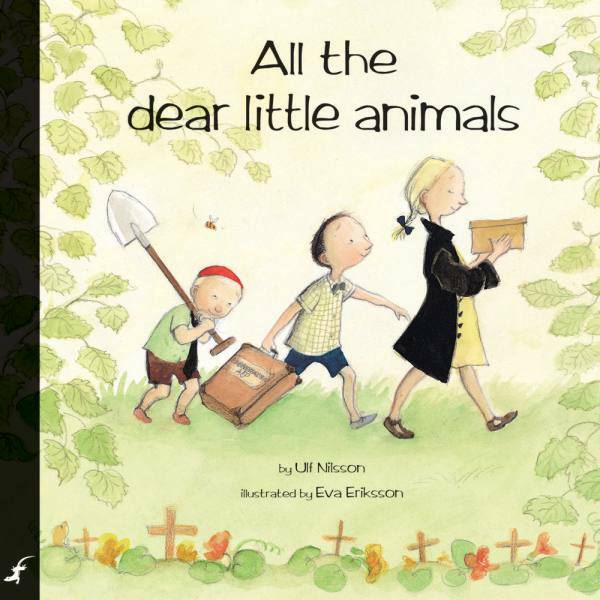 All the Dear Little Animals, by Ulf Nilsson, is a whimsical book that approaches the subject without sentimentality. Three young children start by burying pets for friends then move on to wild animals. One child does the digging, one writes the poems and the other just cries. This story captures the playful, solemn and unexpected responses of children to death. The pictures are by the wonderful Swedish illustrator Eva Eriksson. Highly recommended for readers aged 5 and over. It is quite a good read on the theme of dealing with grief, doing so in the context of play, and thus isn’t too sad. I do like the flippant ending: ‘The next day we found something else to do. Something completely different.’ Unsentimental and quirky, the book is aimed at age 7 upwards and its illustrations alone are worth looking at. The author has created three, strong, fictional characters. This is a funny and quirky book that addresses grief and how to deal with it. This beautiful illustrated story uses three children playing to introduce the serious issues of death, grief and mourning. Everything about this story rings true from the intensity with which the children perform the rituals, to the mercenary aspect when Esther, the eldest, decides to put up their service charges from five to ten dollars. The illustrations by a prize winning Swedish artist, Eva Eriksson, show many dead animals without a touch of sentimentality. Highly Recommended. What a delightful quality picture book this is! It’s not so often that so much talent is packed into one presentation. All the Dear Little Animals encompasses good, meaningful story, evocative, whimsical artwork and sound translation into English. Eva Eriksson is highly skilled at creating mood and telling the story through the facial expressions of her characters. Three young children become involved in burying dead insects and mice. They become so engrossed and satisfied with their work that they decide to start a funeral business? In case you are starting to think this topic a little heavy or sad for the children in your life, it’s important to know that the story is told through the words of a five year old and the conversations of the three children. The final page shows a row of crosses in a clearing in the forest. The text reads: the next day we found something else to do. Something completely different. 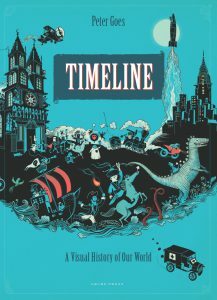 Highly recommended for all ages – a must for school libraries. Having attended bumblebee, bird and mice funerals, it’s impossible not to be charmed by this book’s beguiling authenticity. Equally striking, though, is Nilsson’s lyrical and observational writing style (ably translated by Julia Marshall). Nilsson deftly illuminates each child’s worldview and level of understanding, right down to the brilliant last line. An utter treat that strikes a perfect balance between compassion and humour. Recommended. With an offbeat theme matched by some strikingly lyrical writing, this is compassionate and humorous. 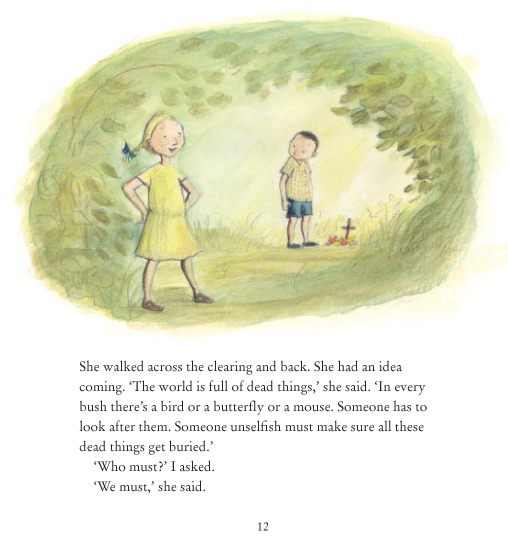 All the dear little animals … has a straightforward above-surface plot, chronicling a day in the life of three children as they set up their own funeral business for `all the poor dead animals on earth’. But there is so much going on below the surface in these 36 pages of text and illustration. Each of the three children is on their own journey to understand a little about death. There is black-coated Esther, the undertaker, with her seemingly unemotional fascination with the physicalities of death. She is joined by her little brother Puttie, all empathy, the trio’s `professional mourner’. And then there is their friend, the unnamed narrator of the book, a frightened funeral poet who needs to examine death through a filter of words. Don’t each of these children live inside everyone?